Speaking at NAEA Fort Worth....I decided it might be a good thing to have business cards. I had some made a few years ago when I had the art show for my masters. However, those featured my personal art. 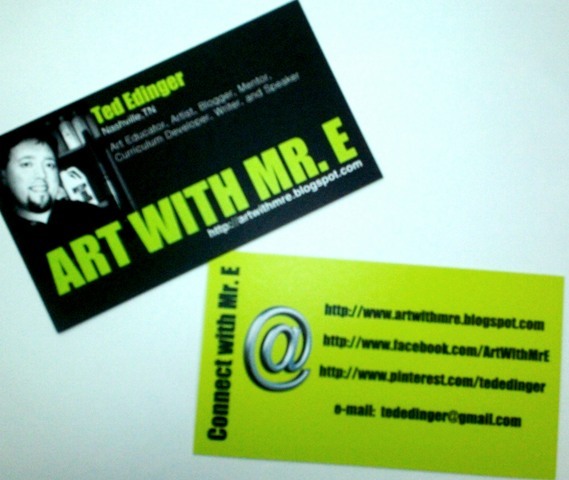 Now I'm more branded as an art educator(though creating art is still important to me)...and I felt my business cards should reflect that. I used Vistaprint ( http://www.vistaprint.com ) to create them. Their site was easy to use, and had so many options!!! The price wasn't too bad...seemed to be the norm as I looked through many sites. My picture I edited on Befunky ( http://www.befunky.com ).